Happy September! Welcome to blue sky days and the winding down of the summer season. Although our summer is still making its presence known, we had a tease of fall a couple of nights ago that promised a welcome cooling off not too far down the road. I’ve overused the word “busy” lately, because that’s what this year has been. Busy with work, busy with family, busy with life. And it’s all a very good thing. The only bad thing about it is that my blog has suffered a bit, as has my inventiveness in the kitchen. I beat myself up about that a little…thinking that I should only post when I have something excitingly new and different to share. Am I right or am I procrastinating? I’m not sure. What I am sure of is that as time goes on and the busier I get, I find it’s the simplest things in life that get you by and prove to be the most enjoyable. Like taking a ten minute break or walk during the week to clear your head, or a lovely longer hike in a forest over the weekend. An evening sitting out on the deck enjoying an unexpected cool breeze and the night sounds. An unplanned road trip for a day just for a change of venue. An ice cream on a sugar cone. A spontaneous run through someone else’s sprinkler on a hot day! Moments. Enjoying the simpler things also applies to food. Of late we’ve been enjoying the simplest of dishes comprised of the summer season’s bounty. Bacon, lettuce and tomato sandwiches both traditional with plain bread and mayo…and with some twists, fresh field peas, green beans from the garden roasted or snapped, a squash casserole, or with a bit more effort a squash and tomato galette, watermelon salad, grilled corn salad, lemon, strawberry, blueberry, or peach sorbets or pops…simple, delightful. So today what I’m sharing is just that. Some simple, easy foods to enjoy before the season is over and we move into fall. Some of the recipes above I’ve posted before and you’ll see those highlighted and can follow the links to their posts. Some of the new recipes below aren’t really recipes so much as a method. Most all of them are quick to make and leave you with some time to sit and enjoy their simply wonderful flavor. I highly recommend dining alfresco if you have the opportunity! Some seriously good eats. 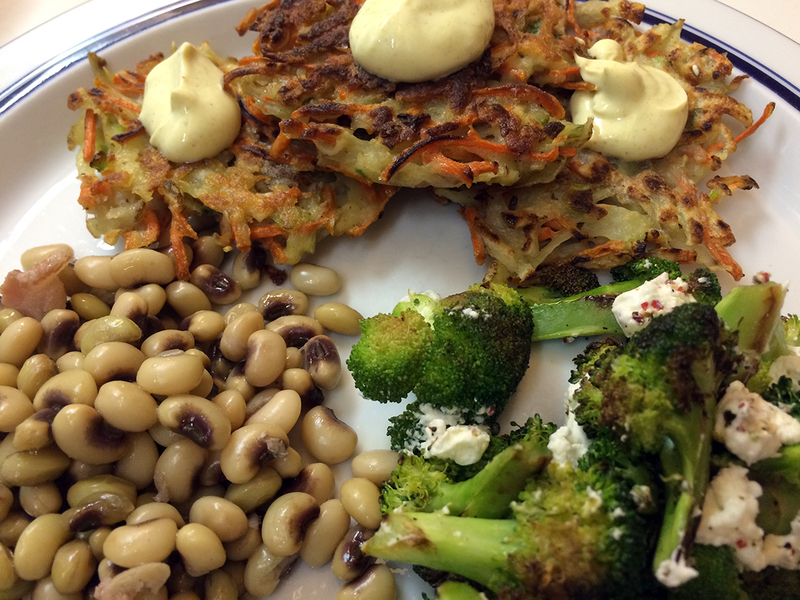 Field peas, charred broccoli with lemon and goat cheese and Cooking Light’s carrot and potato pancakes with curried yogurt dipping sauce. A Vegetarian’s delight! Place the peas or the green beans in a medium-sized saucepan. Cover with water by 1 inch. Add the bacon, salt, pepper and sugar and stir to combine. Bring to a boil over high heat, then turn the heat down and cook until just tender to the bite, about 15 to 20 minutes. Scoop out with slotted spoon and enjoy. 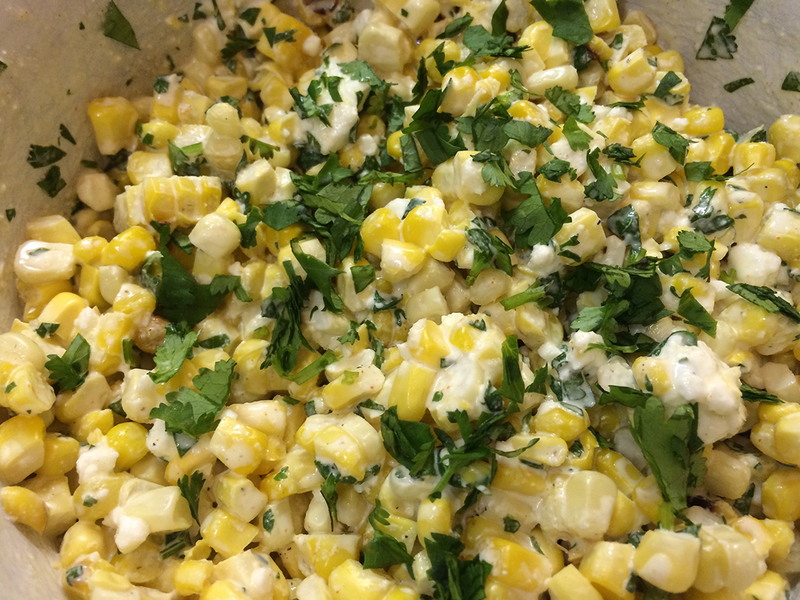 If you only try one of these recipes, make it this corn salad! (Slightly adapted from Bon Appétit Magazine) My new favorite! Prepare a grill or grill pan for medium heat. Grill the corn, turning it occasionally until tender and charred, about 10-12 minutes. Remove from the heat and allow it to cool slightly. Using a chef’s knife, hold the cob upright over a cutting board and cut the kernels off the cob cutting downward. Transfer the cut corn kernels to a medium bowl. In a large bowl gently combine the watermelon, mint or arugula, a generous pinch of salt and several good grinds of black pepper to taste. Add the feta cheese and gently toss to combine. Taste again and add more salt, pepper and feta if desired. Serve within an hour, ideally, to keep the watermelon from becoming too soupy. You’ll have to decide for yourself how many this will serve depending on your level of hunger…at least 2 folks. Prepared crust gets this on the table in 15 minutes from the time your bacon is cooked. Preheat your oven to 450 degrees F with a pizza stone placed in the middle rack of the oven. If you do not have a pizza stone, place your crust on a flat baking sheet instead of a pizza peel and proceed to top it as below. Place a good pinch of corn meal on your pizza peel if using one, then place the prepared pizza crust on top of that (or a baking sheet if not using a stone.) Drizzle about 1/2 teaspoon of olive oil over the pizza crust and use your clean hands to rub it all over the surface and edges of the crust. Place the tomato slices evenly across the crust leaving a scant 1/2 inch border along the outside, trying not to overlap but covering the surface area of the crust very well. Sprinkle the black pepper over the tomato slices and then evenly distribute the basil over the tomato slices. Place the mozzarella on top of the tomatoes and basil, again evenly distributing. Using the peel, place the pizza into the oven on top of the stone, centered, or place your baking sheet directly into the oven. Bake the pizza for 10-12 minutes or until the cheese is golden brown and bubbly, and the edges of the crust are nicely browned. Use your peel to remove the pizza from the stone and place it on a large cutting board, or slide your pizza off the baking sheet onto a cutting board. 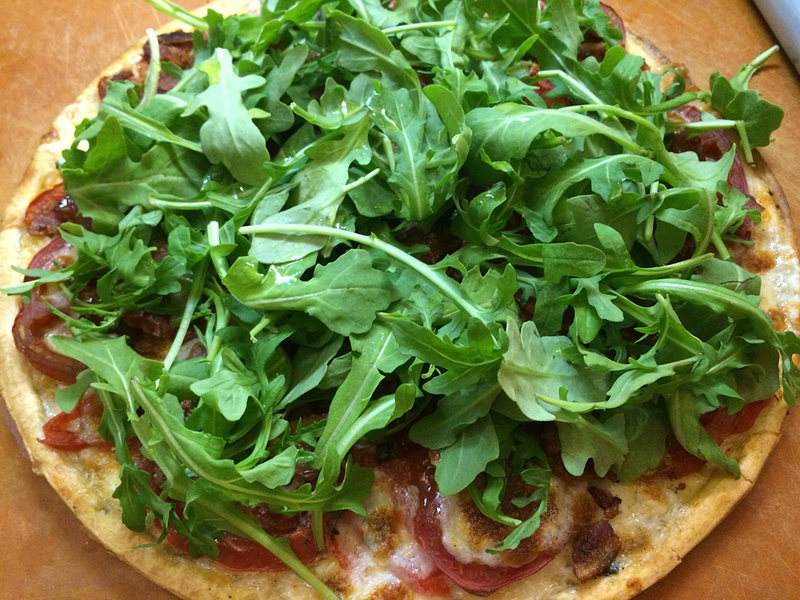 Top the hot pizza evenly with the crumbled cooked bacon, then the arugula. Finish the pizza with a tiny drizzle (about 1 teaspoon) of olive oil on top of the arugula. Cut into six wedges and serve. BLT Pizza is a one dish meal!